Pico-Robertson (Primarily Persian Jewish): Unlike the past few years, in particular 2013, there was NO public killing of chickens in the Pico-Robertson area for Kapparot. Congregation Ohel Moshe advertised it on their building and over the walkway; we forced them to move their banner. Most importantly, there was NO Kapparot happening there, unlike two years ago. Last year, that Congregation outsourced their activities to the private home of Hershel Cohen on Livonia St; this year, we did see signs of a handful of dead chickens in the back of his truck, but no live chickens were at his house, which means we pushed the entire endeavor underground. Underground means less death, as they were not able to brazenly violate the law the way they have in the past. Major Success! Two activists faced a citizen's arrest in exchange for the arrest of the son of Mr. Cohen along the way. San Fernando Valley (Primarily Persian Jewish): Similar to Pico-Robertson over the past few years, there has been at least two sites in the valley where Kapparot was actively taking place. I am happy to report that there was NO public killing of chickens in the San Fernando area for Kapparot. Rabbi David Loloyan rabbi even went so far as to announce to his congregation that they would not do it this year, explaining that it is completely acceptable to money instead. However, Rabbi Netanel Louie responded to a lawsuit placed upon his opertations with a brazen statement to HIS congregation: "IN RESPONSE TO THIS LAWSUIT, WE DECLARE THAT WE WILL CONDUCT OUR KAPPAROT RITUAL THIS YEAR STRONGER THAN ANY OTHER YEAR. " Nevertheless, we never found the location where it was performed, and surely the lawsuit served to curb Rabbi Louie's efforts to perform the ritual. We do, still, have work to do there. Hancock Park (Primarily Ashkenazic/Hassidic Jewish): While we have been aware of sites in Hancock Park in past years due to their advertisements of the ritual in Jewish newspapers in the past, this year there was no public advertisement. However, as predicted, there was a terrible new site of focus for activists, at the Yeshivat Ohr Elchanan of Chabad. Consistent with Chabad and most Hasidic practice, the slaughter only took place on the morning of "Kol Nidrei," the first service of Yom Kippur. While the chickens were not out there for days on end as they have been in both Pico-Robertson and the San Fernando Valley, there must have been over 2000 chickens slaughtered within hours that morning in Hancock Park, activists seeing the delivery of the battery caged chickens late the night before. Many activists are quite distraught at the horrible situation, in which hundreds of families entered the area to perform the rite. Children covered in blood, birds' wings pinned back in a violent fashion...very painful and disturbing. Fellow activist and media consultant Julia Orr wrote this. Other Areas: This year, activists monitored activities in Santa Monica at the Santa Monica Chabad, in Irvine at the Irvine Chabad, and in Huntington Beach, all of these locations places where Kapparot took place last year. To our surprise, none of these sites could be verified as Kapparot sites. Another victory of sorts! Clearly, our work with the City of Los Angeles and the public awareness generated from past years had a powerful impact this year. Los Angeles Animal Services agendized our campaign this past year, and in late August, in preparation for the September Kapparot season, General Manager Brenda Barnette issued a press release to explain that Kapparot can cross over into illegal activity. It also had a hotline number for activists to call if they see illegal activity. The release itself was helpful, but the actual results are still being discussed, as the phone number at times did not work and people on the other end of the phone did not really know what was happening ahead of time. The most effective response came when LA Animal Services Director of Field Operations, Mark D. Salazar, was contacted by text by me. There is an active investigation currently taking place regarding the Waring Ave address. One bird was confiscated in the investigation, and we are waiting to hear the results of this. Edmon Rodman's article about the LA Animal Services decision to issue a press release appeared in the Jewish Journal, making it more challenging for Kapparot dealers to remain under the radar. 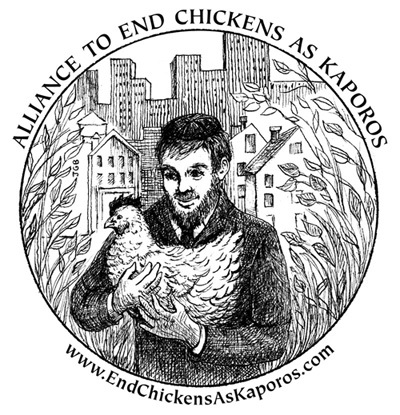 Dave Simon, of Animal Protection and Rescue League (APRL) first issued cease and desist letters and then subsequently sued many of those who engaged in Kapparot in past years, knowing from past rulings that one can establish standing for advocates and others who spend their own resources to combat chicken-based Kapparot. This certainly sent a chill over those who do this ritual for profit; there is no doubt that the lawsuit helped quash the ambition of those interested in profiteering from the suffering of the birds. Activists appeared at all the sites, created event pages specific to particular sites, and have collectively intimidated the Kapparot dealers, creating bad press for them along the way. Older Persian Jews tend to be doing this ritual more than younger ones, who are gnerally assimilating into the American cultural milieu. Thus, over time, less and less of the Persian community will be performing this ritual. Moreover, population growth in the Persian community is similar to American population growth rates; we do not see an increase in Persian Jews in Los Angeles over time. Thus, as the older generation passes on, the younger generation will simply let this old folkway pass. Moreover, it IS, indeed, seen as a folkway, far less ideologically-oriented. Thus, for a community that is worried about its place in American society, our efforts to combat it are met with embarrassment among younger Persian Jews, and this helps to eliminate the practice. However, we know that if frame this as interfering with their freedom to practice their religious traditions, our efforts will be met with deep resistance and we could see the rise of the tradition all over again. Hasidic Jews are ideologically driven to perform this tradition. As a result, it will take much more work, greater sophistication, and wiser tactics to tackle this eight hundred year-old tradition. This is one reason why we have avoided focusing on Hasidic sites: They will resist this imposition of what might be percieved as Western thought on their customs. Moreover, Chabad is a very well-funded organization that will fight us in the courts at the slightest opportunity. Also, Hasidic families can AVERAGE eight to ten kids in certain parts of the country, so as time goes on, this ritual may actually increase if we do not push back. On the other hand, the Hasidic community is very concerned with following the law of the land, so if the laws somehow outlaw this ritual, they will bend to follow the law (for the most part). As a result, I am beginning to see if there are ways we can both enforce current laws and pass new ones that will make this ritual virtually impossible to perform, at least at an affordable cost. ON MONDAY, I am meeting with an animal rights attorney who is involved in state legislation efforts to see if we can pass laws that would make this ritual almost impossible to perform or, at the very least, make the last moments of the lives of the birds less horrific by protecting their fragile bones and minimizing their agony. One such direction I am pursuing is a law that dictates how these osteoporosis-injured "spent" hens are held in California, recognizing that they are almost definitely breaking bones along the way. I am pursuing a deeper understanding of how they are held and whether it is dictated religiously...will report back once I figure it out. So, that's it for now...if you have any questions, please email me independently and I will respond to questions in my next email. Thank you to all those who have contributed time and energy to protect these suffering hens and roosters, who have no way to properly thank you for your commitment to them!